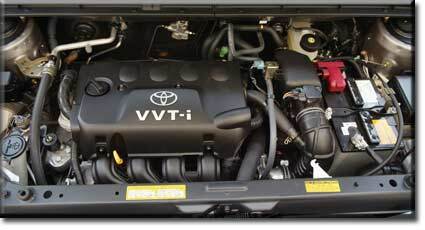 The 2008 xB has a 158 horsepower 2.4 liter DOHC engine from the Camry four-cylinder replacing the 103 hp 1.5 liter four; an electronic automatic is available, and the boxy Scion is now bigger and faster, and a little less boxy. We will have more details when they are released. You can also see more on our future Toyotas/Scions page. The largest Scion may be the smallest SUV you can buy: the xB is short and narrow but tall, providing terrific headroom but minimal parcel space. Unlike the xA, it feels fairly large inside, thanks to expanses of glass in every direction, a very boxy design that doesn't impinge on passenger space, and better rear headroom. The exterior styling is just about the opposite of the tC: it's pure box, a style which the Hummer and Land Rover have made surprisingly fashionable among SUVs. More than anything else, the Scion xB resembles a slammed, customized, shortened Chevy Blazer. Underneath the body - loved by some, hated by others, and still unusual enough to invite comment by strangers - is the standard Scion powertrain and suspension. Like the PT Cruiser, which has similar dimensions but considerably more weight, the Scion has surprisingly good handling, with tight steering and a good grip on the road. Stability is good at highway speeds. Our test car, it must be noted, had a $220 antiroll bar installed at the factory - an option we recommend to everyone. The price isn't unreasonable and the at-factory installation is welcome; what's more, there are no negative side effects (unlike, say, lower profile tires). The down-side of the Scion xA and xB is the engine performance with the automatic. Though the 108 horsepower engine is surprisingly sprightly with a manual transmission, thanks to the vehicles' light weight and Toyota's traditional skill in selecting gear ratios, the automatic can feel spongy and indecisive under hard acceleration or at highway speeds. The good news is that it is still frisky in city driving and 0-to-50 sprints, and gets excellent gas mileage for an automatic-transmission SUV of any kind - or, for that matter, an automatic-transmission car; it also downshifts readily if not instantly when needed for passing power. The Ford Escape hybrid is selling based on its 30-mpg mileage; the xB easily beats that, and at a much lower price. Cargo room is fairly minimal but it is nicely arranged: rather tall and easy to access, and protected by an optional but well-designed cargo net which includes a small-object container. You can quickly expand the cargo bay by taking advantage of the fold-flat seats, and extra-long objects will fit if the front passenger seat is reclined all the way - which makes that seat relatively (though not completely) flat as well. It's the flexibility of a minivan in a compact car / wagon / SUV. The interior is rather different from the xA, and a bit more ornate. The dashboard is not quite as simple, and features a variety of ledges which are good for temporary storage, as well as a surprisingly useful deep well in the ledge above the glove compartment. The end result is a less "cheap" look, though the same materials are used. In addition, the instrument panel - a single large, round pod mounted off-center, facing the driver - looks better than the simple xA panel. It contains the same gauges (speed, tachometer, gas) in a pleasant arrangement, with white backlighting; again the speedometer is black-on-white while the other gauges are white-on-black. In a rectangular section to the right of the gauges are the PRNDL (gear indicator), clock setting, odometer, and warning lights. The 120 mph speedometer is a bit of an affectation; it would be easier to read if it only went up to a reasonable 100 mph. 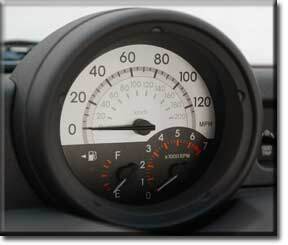 As it is, half of the speedoometer is taken up by speeds that are illegal in many locations. The interior, as with the xA, is black, set off by dull chrome/aluminum colored trim. It shares the xA's clever and efficient round vents and its excellent stereo system - a Pioneer unit that looks as though it was installed by the owner rather than the factory. All adjustments must be done with buttons, and the layout isn't especially intuitive. The power button is just to the right of the center of the unit, not where most people would look for it - and the lettering of the mode choice / power button is silver on silver. On the lighter side, it is very easy to adjust the sound processing, which has three modes - none (good for talk radio), hear (similar to loudness), and feel (which heavily emphasizes bass response). Controls are simple and fairly logical, with a pod on the left side for mirror and backlighting adjustments, as well as shutting off the traction control; headlights and wipers are controlled from stalks. The center stack has a large radio, climate control with oversized knobs for easy use, and a storage bin with an opaque cover. Underneath this are three blank panels which are presumably to be filled by options on some models, but not ours. In between the seats is the gearshift, a pair of primitive cupholders, and a couple of uncovered storage bays that complement the map pockets on both front doors, the minibins, and the glove compartment itself - which is a bit larger than that of the xA (or less crowded with materials), and has a special slot for eyeglasses and such. Though it has a cheap-looking ignition keyway, a bare instrument panel, no map pockets for the back seats, and very simple cupholders, the xB does have a lock on the passenger side and a real ashtray. The feel is a bit more refined than the xA, with a smoother but still connected-to-the-road ride; part of that may be the result of added wheelbase and weight. The xB feels very nimble, and likes to turn sharp corners with nary a care, thanks partly to the strut brace but largely to the low stance, suspension design, and stability control - the latter very unusual in this price class. The standard Goodyear Eagle tires are a good compromise of comfort, noise reduction, and handling. Standard traction control also helps - as do standard four-wheel antilock brakes with electronic brake distribution. Also in the name of safety are prosaic but useful adjustable headrests for each passenger, and fender-mounted turn signals so everyone knows where you're going. Visibility is excellent, with the barest of blind spots, strong, well-focused headlights, and a standard rear wiper/washer with a defroster that puts extra heat onto the wiper blade to prevent icing. Rear seats are fairly comfortable, with surprisingly good legroom - especially when compared with the xA - and excellent headroom, but no conveniences such as cupholders or map pockets. The view is good from every seat thanks to a low beltline and high seats. The Scion xB costs $14,995. Our test vehicle had a six-disc CD changer ($400), alloy wheels ($665), floor mats ($120), a rear bumper protector ($58), cargo net (useful but pricey at $49), and the front strut tie bar ($225), bringing the total, with destination, to $16,507. If you check out a minivan or SUV - even a tiny one - you'll see that this is quite a good price, especially considering the standard stability control and full ABS. 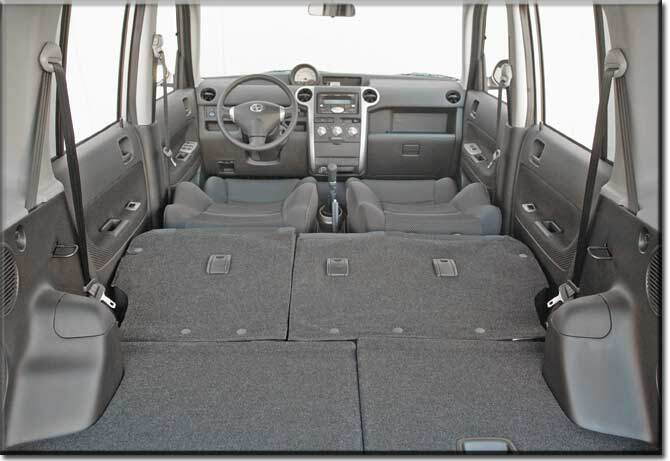 While the Scion xB not huge, it can hold the shopping bags from a trip to the grocery, and the seats fold in for more space; the small size is quite helpful in fitting into garages and parking spaces, as well as providing a nimble feel. In short, the xB isn't just a good alternative to a small car; it's a worthy competitor to "cute-utes," and even mid-sized SUVs that aren't being fully used. After all, most people only need a lot of space on rare occasions; it makes more sense to spend less on a more thrifty, environmentally and oil-dependency-wise more sensible, less expensive, and more fun vehicle, and to rent or borrow something larger when it's needed. The xB, particularly with the stick, is indeed fun, and it's certainly a responsible and economical purchase. 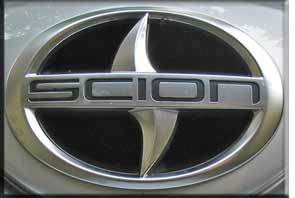 We now have a page dedicated to Scion specifications - click here to visit.